Got only 10 minutes to turn your everyday tresses into something that looks like it took hours? We're here to help you elevate your look -- in 10 minutes or less, we promise! You've got 20 minutes to put on your makeup and get dressed and your long hair is a mess. What to do? Here are five must-have tips on how you can transform your hair into a sensational new 'do in 10 minutes...or less! Having an assortment of hairbands—formal to flirty and casual—on hand is just as important as having Band-Aids in your medicine chest! A. Apply a hair oil like Macadamia Healing Oil Spray and brush your strands straight back. B. Reapply the oil over the smoothed strands and either leave your hair down or put in a low ponytail. Note: You can spend or save when it comes to hair accessories, depending on your desire and your budget. But keep in mind that trendy pieces may be "out" next season and therefore might not be worth the splurge. If you're going to drop more dollars than you're accustomed to doing it, save it for timeless pieces that you can use from season to season! Need a change of pace? Are your hair-saving headbands giving you a headache? Collect a few pony cuffs, ranging from leather to enamel and chrome, and create a Clark Kent hair moment—no phone booth required! L. Erickson “Atelier” Cuff Ponytail Holders are available in 18 enamel colors. A. Apply a hair oil like Paul Mitchell Awapuhi Wild Ginger Styling Treatment Oil and brush your strands straight back. B. Reapply the oil over the smoothed strands and pull into a low ponytail. C. Spritz on a light-hold hairspray to keep the look smooth and polished. We love Macadamia Control Working Spray for flexible finishing. Clips, barrettes and flowers. Pulling the hair to one side or pinning grown-out bangs into a poofy top style are just two things you can do with these handy items. The key: This is your time to splurge. Cheap-looking fabric or silk flowers or barrettes are deal breakers in terms of your style. Shop for the most expensive barrettes and flowers you can find and then look for lower-priced items that come as close as possible to top brands. Time to put your schoolyard braiding skills to good use! Good news: You need not be a tapestry-weaving braidinista to accomplish these three quick 'n chic styles. 1. Separate your hair into front and back sections (create the two sections by parting the hair from one ear over the head to the other ear). 2. Put the back section into a low ponytail, braid it and tuck it under to create a soft chignon. Secure with bobby pins. 3. Addressing the front section, create a side part. Divide the heaviest side into two horizontal sections. 4. Starting with the bottom section on each side, loosely braid the hair, wrap it around the bun and secure the ends with bobby pins. Do the top section last. 1. Separate and secure three loose ponytails that are about 2" apart. 2. 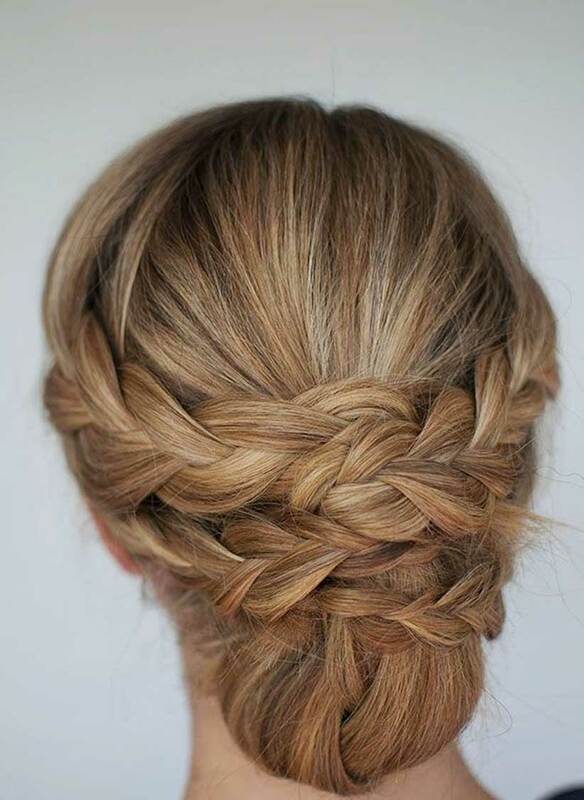 Braid each one and then twist it into a bun. Don't worry if it's messy; it's supposed to be! 1. Using small sections, make two braids in the front of your hair on either the right or left side. 2. Pull all of your hair back into a tight pony, fasten with an elastic and position it as high as possible on top of the head. 3. Braid your ponytail to the ends. 4. Twist your braid around the ponytail holder until it forms a top knot; then secure with bobby pins. If you love our style suggestions but your hair is an oily mess, add three minutes to your styling time by treating it with a dry shampoo, which not only takes away the greasies but also gives your hair more bounce and body. Click here to find your perfect match!